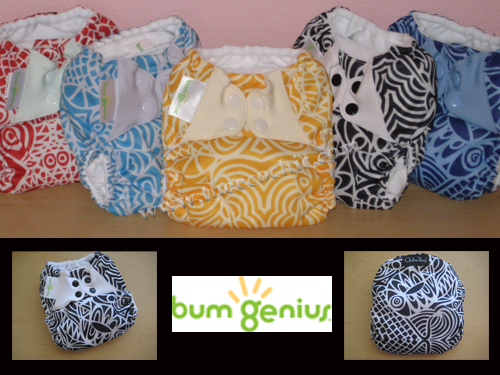 With much anticipation I wanted to be among the first to welcome prints to the bumGenius line of cloth diapers. As you can see the papparazzi spotted Lil’ B late yesterday afternoon sporting a first edition – luckily the papparazzi (aka The Eco Chic) didn’t publish the pictures until after Jenn Labit of bumGenius was able to make the official announcement to the world on the Cotton Babies YouTube network. Lil’ B celebrated the release by standing in the front yard (wearing her new Eiffel Tower bumGenius print in black & white) yelling, screaming, dancing, pointing, and waving as our neighbors drove home from work last night. (OK – so she waved at the houses on our block – we didn’t actually see a single person, car, or animal while we completed our little photo shoot) She wanted me to tell you that she wants to find out more about this new fashion designer Chelsea Perry who made he (already) fabulous bumGenius even more hip and trendy for her. She is excited to be the first on the block to have the entire Tiny Socialite Collection in her wardrobe and can’t wait for her next gala (playgroup) to show them off to her adoring fans! The Tiny Socialite Collection consists of the Concrete Jungle (red/pale green – looks white), Jet Setter (purple/blue – looks like a navy), Free Spirit (clemintine/pale yellow), Retail Therapy (teal/lavendar – looks like a teal and pale grey), and of course Lil’ Bs favorite the Eiffel Towel in black & white. The Tiny Socialite Collection is the first collection in the bumGenius Artisit Series – meaning other artists designs will be featured in the future. There will even be information on how you can submit your favorite artist (maybe even you) to be featured on a bumGenius. I’m super excited (as some of my Facebook followers may have noticed) and enjoyed teasing just a little about our fluffy mail. See these are my first bumGenius 4.0’s in our collection. Since Lil’ B is 21 months and has quite an extensive stash of fluff (primarily bumGenius 3.0s and Rumparooz) I haven’t purchased any new diapers in a while. The Artist Series are the 4.0 generation and ours came with coordinating snaps and tabs – also available with hook and loop closure. I’m a huge fan of the Flip snaps and the 4.0 are very similar. I’m very pleased with the updates from the 3.0 – the new larger size, access to the elastic, and the new pocket configuration. The most obvious difference is of course the larger size options. At 21 months (and approx 25lbs) Lil’ B had her Artist Series set on the middle rise snap adjustment – plenty of room to grow (or for that rolly polly baby/tot). Where can you buy these lovely pieces of artwork? Cotton Babies will be accepting pre-orders starting today; retailers will have the opportunity to purchase them starting tomorrow. I’m sure that my favorite retailer, Kelly’s Closet, will have them available for pre-order starting tomorrow. Diapers will ship to you starting November 16th so you may even get them in time for the Thanksgiving Holidays. I know what will be on the Wish Lists for babies this year – bumGenius Artist Series cloth diapers! Enough about what I think of them (of course I LOVE them) I want to hear your thoughts! Tell me which color is your favorite! Tell me what you like most! And be sure to hop on Twitter today and shout about #clothdiapers by sharing the link to the YouTube reveal. Let’s get #clothdiapers to trend on Twitter – and raise awareness that cloth diapers are hip, trendy, artistic, fun, and better for our babies and the environment!